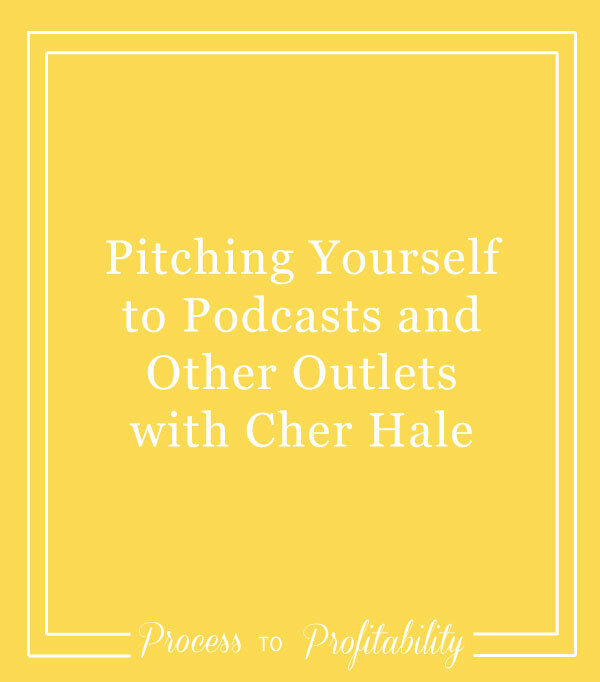 Today I’m talking with Cher Hale and we are talking about pitching yourself. We cover topics like why it’s important for entrepreneurs to pitch themselves, what types of opportunities are available for you, and how you can create a pitching process of your own. Cher also talks about what makes a good pitch and how she does research ahead of time to make sure that whatever outlet you are pitching is a good fit and then we talk about following up. I give some examples of pitches I’ve received and follow-ups so that you can hear from a podcast host what that feels like. We also talk about what happens if you get a no or a yes after you pitch and how you can continue that relationship in a positive way. Cher Hale is a publicist who helps authors, activists, and artists tug at more heartstrings + get more eyeballs on their work. She specializes in writing cold (but heartfelt!) pitches and has landed interviews on outlets like The Unmistakable Creative, goop, and NBC. When she’s not writing emails, you can find her re-watching Remember the Titans, playing with her cat Totoro, or hiking somewhere in the PNW.